In 1942 the city of Winnipeg held an "If Day," dressing its burghers up as Nazis to show the locals some of the terrors of life under the Third Reich. 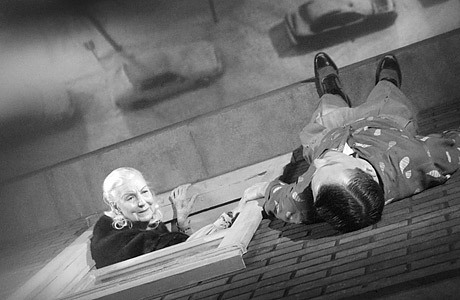 For Canadian deranged-genius filmmaker Guy Maddin, every day is an If Day: his movies transform his hometown reality into comedy-dramas of sibling rivalry and family life that would give Freud the creeps. So Maddin is not the most reliable reporter. In spite or because of that, My Winnipeg is a trip: a "docufantasia" that mixes the city's history with Maddin family values. He moves back into the home where he grew up, hiring actors to play his relatives  including Ann Savage, the notorious harridan of the 1945 cheapo-noir classic Detour, as his mom. Filming in black-and-white, streaking the frame, explaining the action with silent-movie intertitles, Maddin must want us to understand that, in movies, nothing is real, and everything is true. Oh, and My Winnipeg: it's weird-hilarious.